America’s fledgling hemp industry recently got its latest boost when the Colorado Department of Agriculture submitted for potential state certification six varieties of hempseeds that, if certified, U.S. farmers could buy to start their own crops. Hemp cultivation also is benefiting from rising demand for CBD products and new applications for hemp. The plant is used for medicines as well as products ranging from clothing to building materials. Colorado’s seed program, unveiled last month, comes as hemp cultivation has been hindered by a dearth of seeds and their high cost. Hempseed prices can range from $25 a pound to $1 per seed, the Associated Press noted. Colorado seed breeders have spent years developing seeds that produces a crop with a THC level of no more 0.3%. Otherwise, the plant is considered marijuana and must be destroyed, making hemp a risky gamble for farmers. 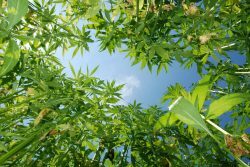 Despite the advances, observers caution it could take a decade or more before American-grown hemp dominates the U.S. hemp market – which was $573 million in 2015 – the way imported hemp does today. How soon depends partly on if or when Congress approves new legislation that expands hemp cultivation from research and pilot programs to a full-fledged commercial industry. Aside from CBD-based medicines and clothing, hemp is used for various products including paper, food, lotions and supplements. It’s also used in industrial applications. While hemp processing and hemp products have been legal here for decades, hemp cultivation was illegal until President Obama signed the 2014 Farm Bill. It allowed hemp cultivation, but only for research purposes and some select pilot programs. Farmers who want to grow hemp must be certified by the state where they live. Consequently, more than 95% of the hemp in the United States has been imported, mainly from Canada, Europe and China, according to Steenstra. In 2015, less than 10,000 acres of hemp were under cultivation in this country. While 29 states permit hemp cultivation, most of today’s domestic crop comes from Colorado and Kentucky. Still, efforts and innovation in infrastructure and seed development are underway, and the inklings of a commercial market are emerging. Consider CBDRx, a Boulder, Colorado-based company that cultivates between 130-160 acres of hemp annually. The company also extracts CBD oil from its hemp plants and uses the leftovers for processing into paper and animal bedding. Recently, CBDRx partnered with Pure Vision Technology, a biorefining company in Fort Lupton, Colorado, to process some of its hemp into paper. The company’s CEO, Tim Gordon, said he developed his strains from feral hemp and is working on a new strain that can be used to extract CBD oil. The plant’s stems and stalks can be converted into paper and non-woven textiles, like hospital gowns. Gordon hopes eventually to submit his strain’s seed to the Colorado Department of Agriculture for certification, and license it. “Steps like this are bringing hemp back to U.S. soil,” Gordon said, referring to Colorado’s seed program. Domestic hemp is also taking root in Kentucky, where the state’s agriculture department holds a U.S. Drug Enforcement Administration permit for hemp cultivation. Farmers who want to cultivate hemp must apply for permission from the department. If that permission is granted, the farmers buy the seeds from companies that import them. The biggest Kentucky seed importer is Atalo Holdings in Winchester. The company has imported and replicated seeds for 58 farmers who collectively account for 1,650 acres of hemp acreage in the state. About 450 acres are for CBD and the rest are for grain, said Atalo CEO Andrew Graves. He added that he expects the number of farmers the company serves to double next year. In all, Kentucky has authorized about 4,500 acres for hemp cultivation, while Atalo has been allotted 2,500 acres of that amount, Graves said. Kentucky does not have a medical marijuana law, but in 2014 the governor signed a law making it legal for epilepsy patients to use CBD oil with a doctor’s recommendation. The CBD oil cannot be transported out of state. Graves said the crops and replicated seeds can be called domestic even though they’re derived from imported seeds. Kentucky has certified hemp eeds, too, he said, but just hasn’t touted it. Another factor helping domestic hemp cultivation is demand for CBD-based products, observers said. Indeed, both Gordon at CBDRx and Graves at Atalo said demand for CBD is high, which is why significant amounts of their crops eventually end up being used for CBD extraction. Steenstra estimated that 50%-60% of U.S. hemp acreage is being grown for CBD purposes, mainly because in some states there is an existing capability to process it as well as demand for the compound. “CBD and other cannabinoids are a quick and up-and-coming market, so it was easier to jump into that,” Steenstra said. CBD and cannabinoid-based hemp products accounted for 11%, or $65 million, of the $573 million U.S. hemp market in 2015, according to the HIA. Hemp-based personal care products made up 26% of sales, or $147 million, followed by industrial applications at 20%, or $116 million, consumer textiles at 17%, or $95 million, and food at 16%, or $90 million. Graves noted his company pays farmers for seeds they harvest from their crops. The crops are based on seeds Atalo procured from overseas. “There are lots of different ways for farmers here to generate revenue out of the hemp crop today using certified varieties,” said Graves. Correction: The original story posted here reported that the six seed varieties had been certified by the Colorado Department of Agriculture. They were not certified but had been submitted for the certification process. With all due respect sir, you may want to fact check your reporting. Unfortunately, misinterpretations and misunderstandings are repeated with the original true facts lost in translation. 1) The CDA has not created 6 varieties of hemp, we are not a breeding company.